NAPHA is offering a test program to our members for their Peruvian Horses in conjunction with the Paso Fino Horse Association (PFHA). We are pleased to join our Paso Fino friends in their ongoing successful program which began last year and is open to all breeds. The Trail Horse Test Program (THTP) provides a way to demonstrate your horse’s ability to perform trail riding skills based on a series of tests that gauges the horse’s natural ability and training against a standard of performance. This is not a competitive trail obstacle course, but a measure of your horse’s abilities to complete the tasks normally performed before, during, and after a trail ride. The elements of the test are what we expect from a well-trained Peruvian pleasure horse. The program is also a great opportunity for both adult amateurs and juniors to connect with like-minded horse owners in a healthy, non-competitive atmosphere. We want to share the joys of horse ownership and the skills of our pleasure horses. There are three levels and awards for each level: Junior, Senior, and Master Trail Horse. 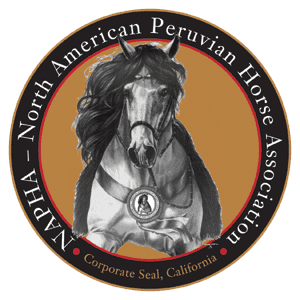 NAPHA registered Peruvian horses may choose to have the level they pass entered on the horse’s registration certificate. Our goal is to provide a structure but fun program that guides you to improve your relationship with your horse and to improve your horse’s skills for the trail or as a pleasure horse. The horse is tested against standards set at three levels of performance: Junior, Senior, and Master Level. The exercises for the three levels are the same. The horse is expected to show more obedience and fluidity as it advances up the levels. The exercises are divided into 7 categories. Each category is further divided into test elements that are scored on a scale of 1 to 5. The horse must receive a passing grade before advancing to the next level. Awards and certificates are presented after completion of each level. Any NAPHA or PFHA member may request to host a Trail Horse Test. A complete description of the program, its rules, and the application form will be provided on the NAPHA website at the beginning of 2018. Provide a structured method to judge a trial horse. Record the level achieved in the horse’s NAPHA registry. This will assist individuals who are researching Peruvian horses/bloodline that are well suited to the trail. A Junior Trail Horse is expected to show the disposition and temperament to be a trail horse. The Junior Trail Horse is expected to show reasonable obedience to its rider, to attempt certain tests and to have basic knowledge of normal commands. The Junior Trail Horse is not expected to be a fully trained horse but is a horse that shows willingness to obey the rider and does not endanger the rider. A Senior Trail Horse is expected to show all the attributes of a Junior Trail Horse plus be willing and consistent. This horse must be able to obey most commands calmly but with reasonable speed. It is a horse that is comfortable in most situations. A Master Trail Horse is expected to be a finished and experienced trail horse. A Master Trail Horse is expected to show obedience to its rider’s commands and should be able to be trusted in any situation. Master Horses’ fluidness in their trail skills set them apart. The is the horse we would like to own and ride anywhere. Category 5: Performance on the Trail – Interaction with other horses. Category 6: Maneuvering through Trail Obstacles – that test the attitude and obedience of the horse. We are looking for people with some experience in judging trail horses to be student judges in 2018. These judge candidates do not need to be NAPHA carded show judges as they will not be judging gait or conformation. NAPHA will be training trail judges throughout the year at the PFHA and NAPHA two day clinics and test sites. If you are interested in becoming a certified judge please send an email to the contact at the bottom of this page. Any NAPHA member in good standing may request to host a NAPHA/PFHA sanctioned trail test. The test must be approved by the JOR Trail Test Coordinator and only NAPHA/ PFHA approved trail judges may be used. The host is responsible for conducting the test according to the rules, for the organization and conduct of the test, and financial management of the test. For more information see the Trail Horse Test Program Rules on the NAPHA website. We want the Trail Test to be accessible to many horse owners at a reasonable cost. The Trail Test host will charge fees to cover ground use, stalls, the judge, the judge and marshal’s hotel and travel, etc. NAPHA will assess a small standard fee per test from the host to cover the cost of the program and awards. The owner of the horse may also request a change to the registry certificate for the current fee for such service to CRLS. A HUGE thank you to Virginia Foster of PFHA for sharing materials and documentation. I am a NAPHA member who has participated in JOR. My older Peruvian gelding was highly competitive in ACTHA when it was still active. I have served as an ACTHA judge as well as for other trail competitions. I’d be happy to help with the Warrenton and Richmond, VA testing. This is a very welcome change for NAPHA! Leah thank you! I am sending you a personal email message. I am not confident of your email so I have sent a message via Facebook.